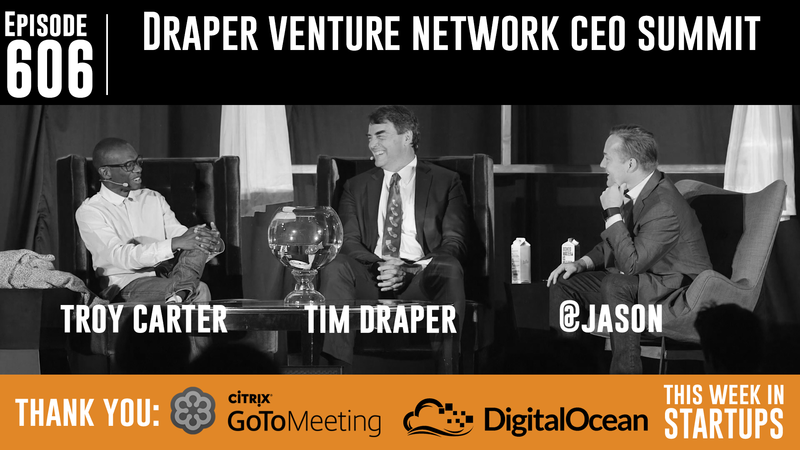 In today’s episode, Jason sits down for an investors fireside with leaders Tim Draper (DFJ and Draper Associates) and Troy Carter (Atom Factory) at the Draper Venture Network CEO Summit. Tim uses his extensive experience to analyze the current startup landscape and predict the future of investing. Troy’s unique background in the music industry allows him to draw parallels between unicorn CEOs and former clients like Lady Gaga. Tim and Troy offer their unique perspectives on a wide variety of topics, including launching incubators, what the sheer volume of startups means for the ecosystem, the biggest challenges looking for angel investing, characteristics budding founders need to be better entrepreneurs, the importance of transparency, needing both courage and paranoia to succeed — and much more. 3:24-6:57: Tim Draper explains why he went the startup route and the thinking behind Draper University. 7:03-9:56: Troy Carter reveals how Atom Factory empowers artists and entrepreneurs. 12:05-15:35: Tim Draper thinks we’re in the middle of a startup boom and that investors have to get pickier. 15:36-18:30: Troy Carter explains how he picks companies for his portfolio, and why he thinks startups are broken on the back-end. 18:31-21:42: Tim Draper also thinks the system is broken, but that liquidity in markets and government regulation is improving. 23:53-26:50: Troy Carter says good startups are getting turned down because the benchmarks keep getting raised. 26:52-29:53: Troy Carter breaks down his own syndicate. 29:55-33:57: Tim Draper predicts what investing could look like in a few years. Hint: BitCoin is involved. 34:02-37:46: Troy Carter talks about the two most promising companies in his portfolio: uBeam and Tuition.io. 38:15-42:32: Tim Draper answers an audience question about working with non-transparent investors. 45:03-47:13: Troy Carter thinks today’s entrepreneurs are missing a healthy dose of paranoia. 47:14-49:31: Tim Draper believes too many founders are concerned with being trendy. 49:32-50:35: Troy Carter compares difficult entrepreneurs to demanding pop stars. 50:38-52:51: Tim Draper thinks people are misjudging Theranos. 52:53-55:00: Tim Draper explains the press backlash over Theranos, and the secrecy surrounding the company.